Doug McClure (1935-1995). Had he lived he would be celebrating his 78th birthday today, May 11. He is greatly missed by all fans of Trampas and The Virginian. Trampas (Doug McClure) and his horse Buck. 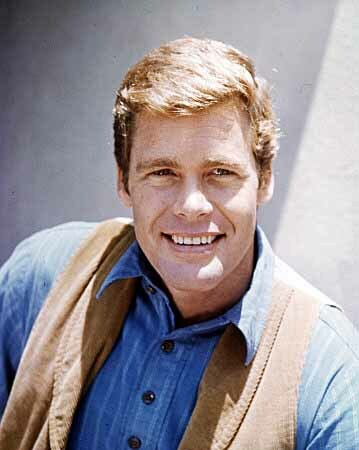 Doug McClure rode at least four different Buck’s on The Virginian. I love this photograph of Doug McClure as Trampas on his beloved horse Buck. Whenever I watched Doug in a contemporary movie he seemed out of place. 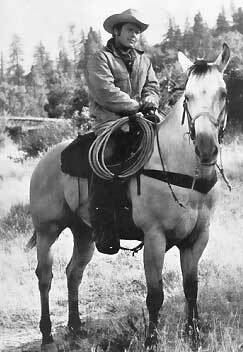 He was best suited to the Western and the character of Trampas was a perfect fit. Was the choice of ditching Percy Faith’s distinctive theme and the familiar ride-in sequence in favor of Ennio Morriconne’s Spaghetti Western influenced theme and tinted images a mistake? It’s a matter of opinion. I like the new theme and graphics but feel they belong to a spin-off show and not the 9th season. The departure is too radical and feels alien to the original concept of The Virginian TV series. The definite mistake was Trampas’ new outfit and his mustache. And a dry stoical ‘batman’ replacing any female regular at Shiloh Ranch. The new format never had time to grow on audiences before the cancellation of The Men From Shiloh in 1971. An era was at an end. Interesting to watch this scene from the 1929 film adaptation of Owen Wister’s novel. Gary Cooper plays the Virginian and Walter Huston plays Trampas in a manner more in keeping with Wister’s original vision. Unfortunately in this scene Huston comes across as a pantomime villain – lacking depth with his swaggering delivery. A legacy from the silent era when body movement was over emphasized to convey emotion. By contrast Gary Cooper manages to convey emotion with less effort. A skill in itself and more in synch with the new era of sound. This is my favorite photograph of Doug McClure as Trampas. It was the first color photo I ever saw of Trampas as a kid in the BBC Radio Times. I envied anyone who owned a color television. Trampas was also my favorite character on “The Virginian.” A natural athlete with plenty of charm. It was a pleasure to speak with his daughter Tane and ex-wives BarBara Luna and Diane McClure for my book. It’s just a pity I didn’t start my book some years ago when Doug was still alive. No unauthorized advertising is allowed on my weblog. Content copyright Paul Green 2013 unless otherwise stated.